At Buono's Flooring, we offer our free in-home estimates for hard surfaces service as yet another way to help our customers. 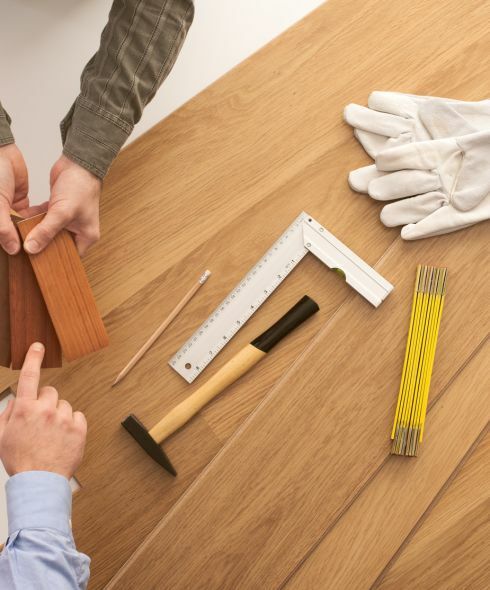 When buying new flooring, it is crucial that accurate measurements be made in order to avoid problems and to get an accurate estimate of cost and time. When buying new hardwood flooring, it is important to order the right amount. You do not want to order too much, as that would be an added expense; however, you do not want to order too little, as that will certainly cause problems, especially if the added ordered material does not perfectly match the original order of material. Accurate measurements can be difficult for those rooms or spaces where there are many corners, doorways, thresholds, or unique features such as stone hearths or curved walls. When you take advantage of our in home estimates for hard surfaces, you are assured of accurate measurements. Most of our customers have busy lives. We can save you both time and money when we perform this important work for you. Our professional estimators are highly skilled at taking measurements, setting up material's lists, offering advice, and giving cost estimates that are both fair and honest. In addition to providing estimates for new wood flooring, we also provide this service for those who need their current hardwood flooring refinished. Whether you need new flooring estimates or refinishing estimates, one of the most important tasks we provide is to answer your questions. We understand that there are many aspects to wood flooring, and our staff is able to answer questions or concerns that you may have about your flooring. This is just another way that we work to help our customers get the most satisfactory results. Buono's Flooring has been in the hardwood flooring business since 1979, and we know what we are doing. We are always happy to share our knowledge and expertise with our customers, to ensure that they get the exact, perfect flooring that they are looking for and that they want. We are located in Staten Island, NY and serve a wide area, including Manhattan and Brooklyn. Call us today to set up your appointment for our free in-home estimates for hard surfaces.